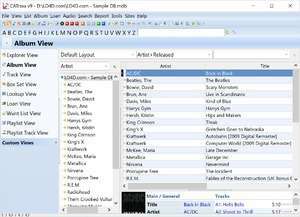 CATraxx is a music collection organizer which saves all of the information it obtains about your mp3s and cds in a database for fast information retrieval. It will essentially automatically download the CD information from the Internet and scan your entire network and/or hard drive(s) for music files it can gather information about. CATraxx will catalog your music files of all known types and also includes support for cassettes, LPs, mini discs and more. CATraxx is easy to use and features a very nice little interface you won't have trouble getting comfortable using. CATraxx 9.49 is a shareware program and can be used as a demo to try the software until the free trial period has ended. A full version of the program is available after the trial period ends. For security reasons, you should also check out the CATraxx download at LO4D.com which includes virus and malware tests. Additional screenshots of this application download may be available, too.